Two weeks ago while doing my first hour task at work, everyone in the office received an advisory from HR. The email has a subject "Amazing Mothers Photo-Essay Contest" and as a Blogger, I got excited! Yes, I wanted to join not just because I love writing but I wanted to make an article about Mother's Day. 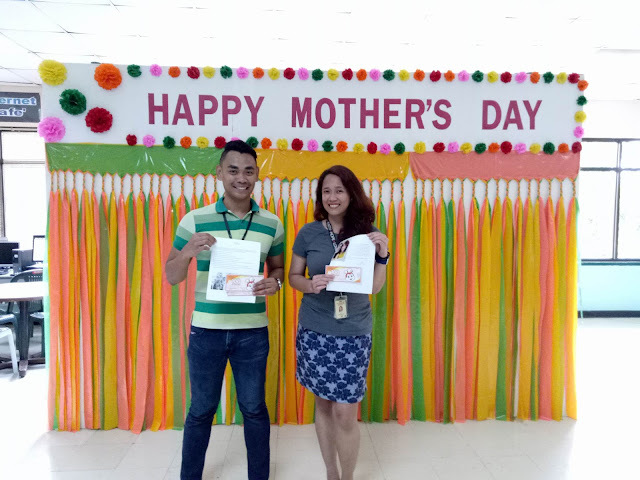 But later while writing my 200-words Essay, I realized I wanted to join to express my feelings to all Mothers out there, most especially to my Mama. It's not easy to be a Mom, here's why! “Ma, asa nimo gibutang akong shorts?” No, I was not six or seven years old when I asked that line. I was already twenty-one with the intellect of doing everything I want. Why do I keep on asking that? I’m fourth in the siblings of six and no, I’m not a spoiled son. It just happens that ever since I’m dependent to my crazy mother! As crazy as coming with me in my Elementary years. As crazy as following me in my JS Prom Night. As crazy as waking up early and served as my Human Alarm. As crazy as reading my Resume even though she is an Elementary undergrad! Now, I’m Thirty-one, I already understand why she did those crazy stuff. She was “crazy” to accompany me everyday in my Elementary life to assist me with a bag of heavily loaded books. She was “crazy” following me in my JS Prom to ensure my safety. She was “crazy” waking up early to make sure breakfast was served before I went to my College day. She was “crazy” reading my Resume because she wanted to show her support before I head to my Job interview. I’m crazy not realizing that earlier. I’m proud and I love my “crazy” Mama.